Not to belittle the usefulness of having an always-on camera and display, but Glass cannot, for instance, overlay graphics over what you’re looking at, as shown in this augmented reality imaginary BMW repair video. Instructions and part highlights are superimposed on the view to guide repair of the car. The piece missing from google glass is the ability to overlay computer generated graphics over the entire field of view. To do this, you either need a transparent display, or one with an opaque display that also feeds in a live camera view. ScopeAR's camera-addition to Epson's MoverIO BT-100 see through display. 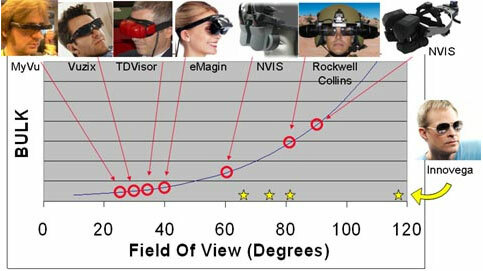 23 degree Field of View. And a final mention goes to Innovega, which has developed a special contact lens used to increase the field of view your eye can see at close range (it's not a display--that's 5 to 10 years out). The contact lens supposedly lets you see 120 degrees of vertical view vs an average of 20-40 degrees for most of the glasses. See the chart below for some comparisons. Innovega's iOptik contact (not a display, just for focusing). pic from Verve review. Innovega comparison of Field of Views. Even though the above glasses give you much more overlap between the display and real-world view when compared to google glass, you can see that many of them are still only able to provide overlays on less than 40 degrees (less than half of your full view). Google Glass provides 14 degree coverage of your view, so these other glasses are adding a good bit of bulk to provide 2-3x the screen size. For comparison, the cover-your-whole-face Virtual Reality headset Oculus Rift has a field of view of 110 degrees. 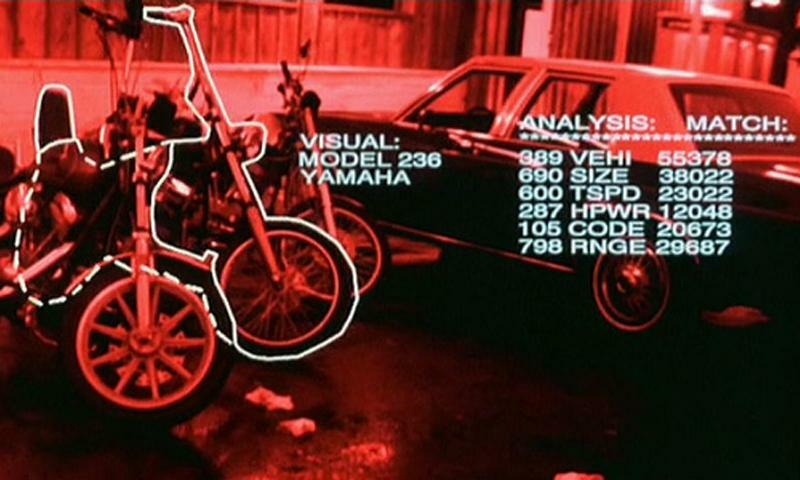 While all the above will provide Augmented Reality overlays, to get to Minority Report or Iron Man interfaces, you also need a precise way to track finger and object locations, which is hard only using video and no depth information--imagine tracking white gloved fingers on a white background. 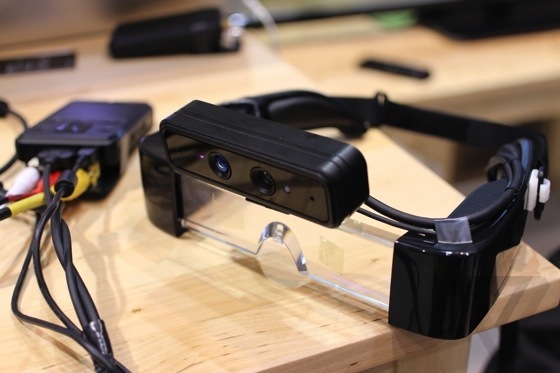 Many of the existing AR applications require 2D, high contrast pictures for tracking, but the Meta 1 headset utilizes a depth sensor to dramatically enhance tracking (check out the great video). 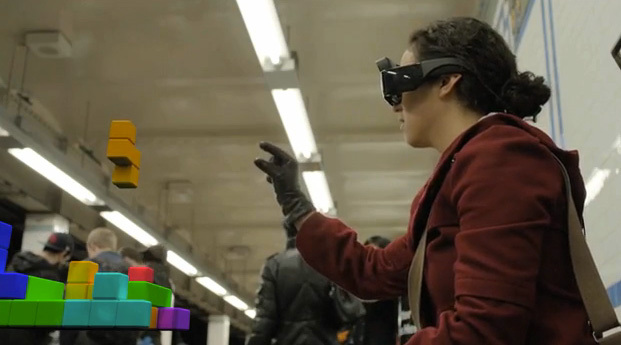 Meta 1 Headset with depth sensor a la Kinect or Leap Motion technology. 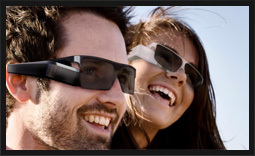 CastAR glasses from technical illusions. For completeness, there's one more device to mention that's being advertised as Augmented Reality, but may be stretching the definition a bit. Technical Illusions's castAR uses small projectors, a special reflective surface, and head tracking to show 3D objects on the surface. The surface is the same stuff used on high way signs, that's extraordinarily reflective, so very small projectors can be used. The 3D effect is enabled by flicking the each eye on and off. LEDs at the corners of the surface seen with a cheap sensor on the glasses for head tracking, to give the feeling that you can look around an object--the projection changes as you move your head around. This enables the 3D effect that you get with the Meta 1, but without having a depth sensor on board. The tracking is potentially much more precise than the Meta 1's tracking, although the meta 1 doesn't require a special surface and LEDs to do this. 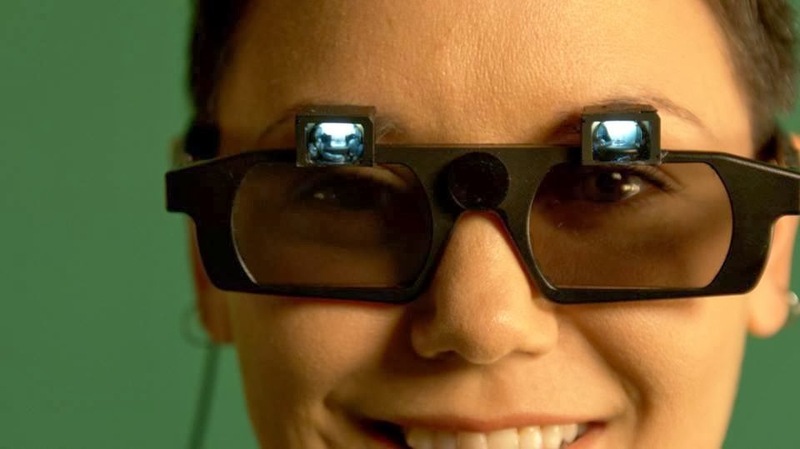 The other main benefit of the castAR glasses is the price tag, hopefully $200 if they get enough buyers on their soon-to-be-announced Kick Starter. I'm just not sure this qualifies as Augmented Reality, since you're projecting on a screen. It can't display on top of anything that doesn't have the reflective coating. Even though you can buy the Vizux glasses right now, don't expect to be able to walk down the street and have building names hovering in the air, or facial recognition showing peoples' names over their heads. The Vizux glasses require a computer connection, and don't have many useful applications ready to use. This brings to the main reason most of these glasses haven't yet been available. Display technology isn't what's holding back widespread use, the main impediments are: computer size, battery life and cultural acceptance. (Steve Mann recently showcased 35 years of work in head-mounted displays and cameras to show that the display part of Google Glass isn't that new of an idea). 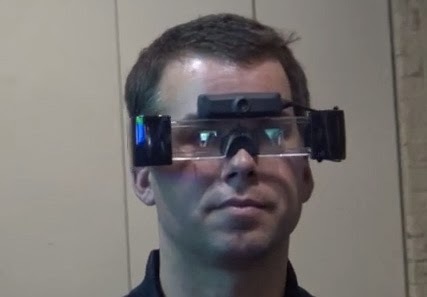 In my eyes, the main innovation of Google Glass is that they made something that looks somewhat cool (at least acceptable? --compared to a fighter helmet) with a useable battery life. I don't know how long the battery would last if you added always-on video processing for Augment Reality, however. Unlike all the other options above, you can actually use Glass without a computer or cell phone connected to it, although having GPS and an internet connection through a phone enhances its functionality greatly. Most of the other devices require a computer connection right now, and supporting applications are very limited. I believe the speed of processors, their conservative energy use and small size will likely bring glasses mainstream in 2-3 years, or at least to industrial and medical arenas that are willing to drop $5k or more on a tool. So what all will we be able to do with these fancy glasses of the future? Sure you can read the news, but how do you click links and type? Some of the glasses coming down the pipe have eye tracking technology (microsoft patent), as well as sensors that can detect subtle movement of muscles around your temple. So the potential to operate in stealth is there. Several companies have cloud-based databases that your smartphone can access to identify millions of different trackers similar to how shazam gathers a fingerprint of songs for identification. Newer tracking techniques do something call SLAM (Simultaneous Location And Mapping) to create a 3D map from a 2D camera feed. This requires you to slowly pan your smartphone or tablet over the scene to do the initial mapping. Soon, "edge-based" tracking will allow your device to recognize predetermined 3D objects without any initial mapping. Depth cameras will make all this much more effective, as contrasting colors and good lighting aren't necessary. With GPS and compass, see street, building names, directions overlaid on everything. Record everything all the time... more security, less privacy?